To view the art you'll need a pair of red-blue 3D glasses. The data will stand out—and you will too. ▲ Our art exhibit at AGBT 2017 asked new school questions in old school ways. In genomics, insights can hinge on a difference of one. 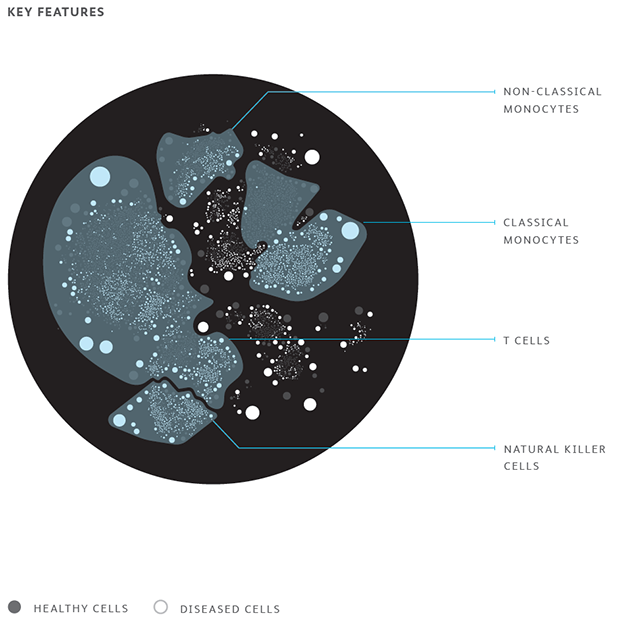 One cellular mutation to go from healthy to diseased. One cell migration from tumor to metastasis. Even subtle differences in gene expression between healthy cells shapes their form and function. 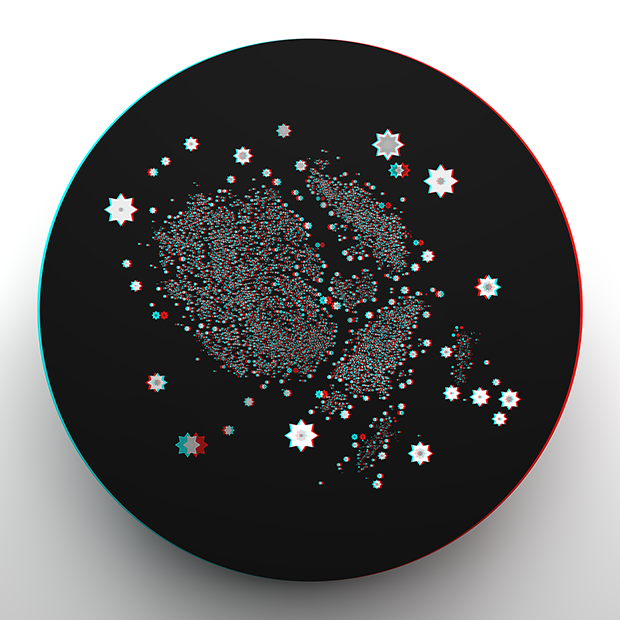 In Data in New Dimensions, we’ve created an immersive data art experience celebrating the individuality and often underestimated influence of the single cell—captured by high-throughput single cell analysis. 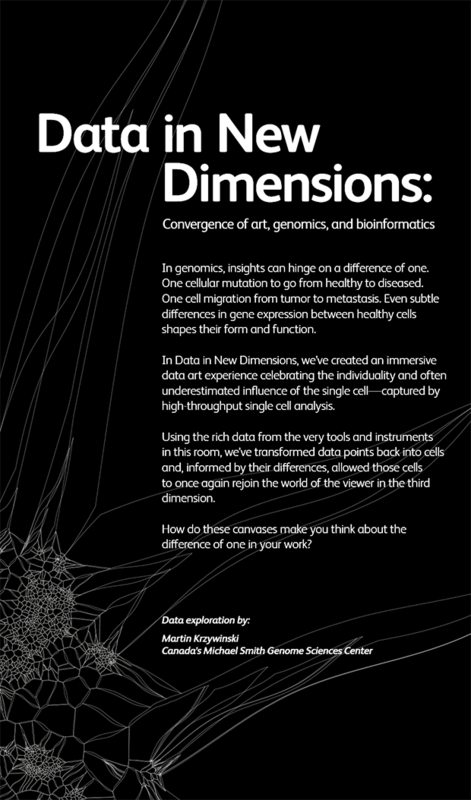 Using the rich data from the very tools and instruments in this room, we’ve transformed data points back into cells and, informed by their differences, allowed those cells to once again rejoin the world of the viewer in the third dimension. How do these canvases make you think about the difference of one in your work? 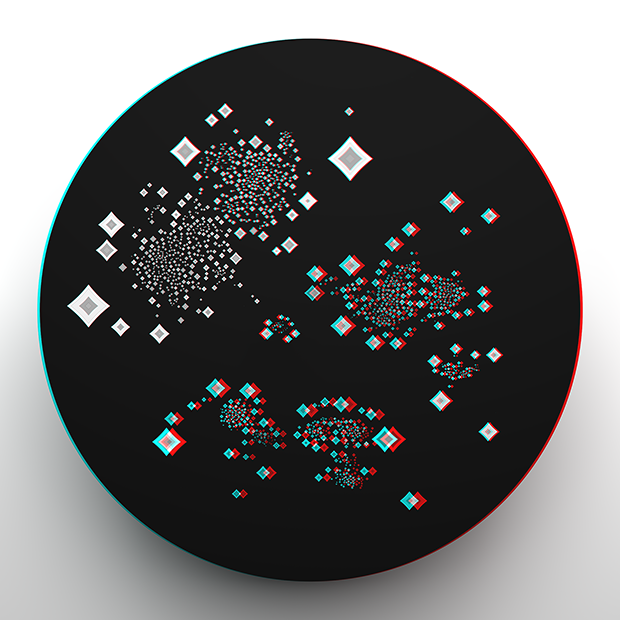 ▲ Data in New Dimensions. BD Genomics art exhibit at AGBT 2017. This piece contrasts two different blood cell states, diseased versus healthy, in such a way that the differences manifest as depth. Cells on the base plane (the closest to the wall) represent healthy control cells, while diseased cells ascend increasingly closer to the viewer based on how different they are from their healthy counterpart. ▲ Blood cells: diseased versus healthy control. This piece paints a picture of the diversity of disease, showing how the cells of a tumor and its metastasis vary in expression patterns. These differences are manifested in the piece through each cell’s position in the third dimension. 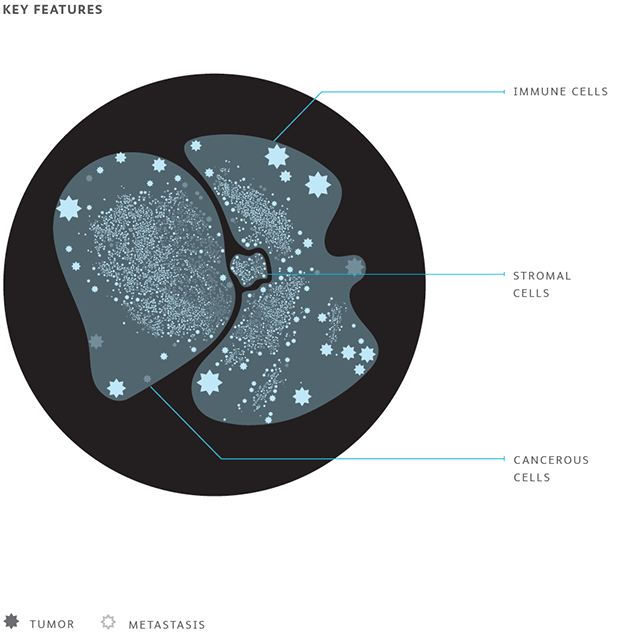 Cells from the primary tumor exist on the base layer (closest to the wall). 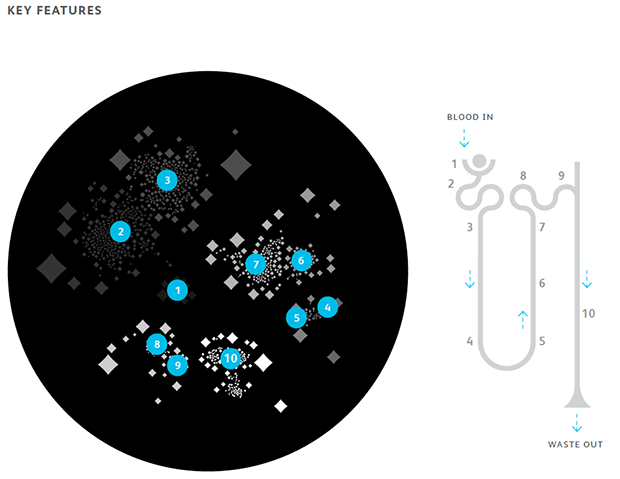 Cells from the metastatic site project into the room based on the degree of difference from the nearest primary tumor cell in their cluster. ▲ Primary tumor versus metastasis. This piece explores the expression differences that help determine a healthy cell’s role within an organism. Each cluster corresponds to a different cell type along the renal tubule, with that cluster’s depth mapping to its position along the tubule. Blood enters the tubule through the cells on the base layer (closest to the wall) and is filtered by the cells in the successively ascending layers. 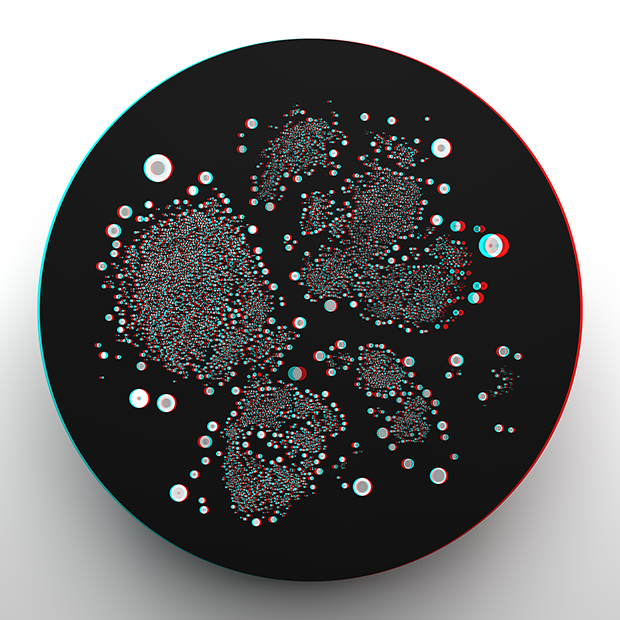 The remaining waste exits past the cells in the layer nearest to the viewer.